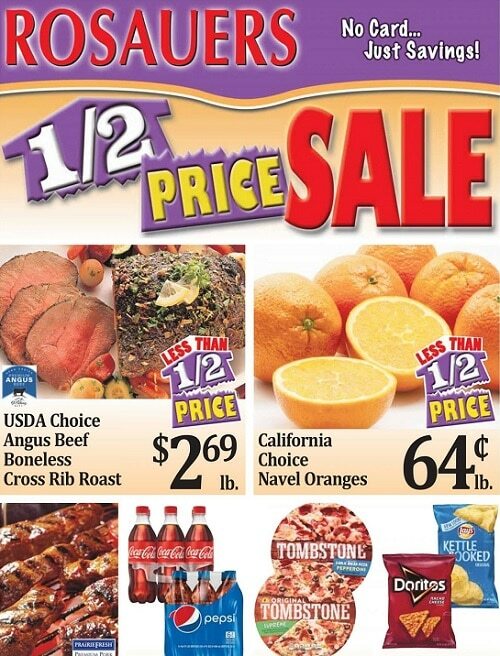 View Rosauers Weekly Ad Sale Specials, valid April 14 – April 23, 2019. Don’t miss the Rosauers Grocery specials, monthly power buys and discounts from the current Ad Circular. Great savings for Seedless California Red or Green Grapes, Nalley Chili with Beans, Angus Beef Bone-In Rib Steak, Oscar Mayer Sliced Bacon, Fresh Halibut Fillets, Alaskan Snow Crab Clusters, Risvold’s German Potato Salad, Cady Creek Farms Swiss Cheese, Wild Caught Cod Loin, Western Farms English Muffins, Russet Potatoes, and more. In the bakery department available in every supermarket, you can buy mouth-watering bread that tastes so much better because it’s made using the traditional recipes of baking from scratch and the freshest ingredients. Also, find great meals in the deli department like baked or fried chicken, pizza, soup or sushi.